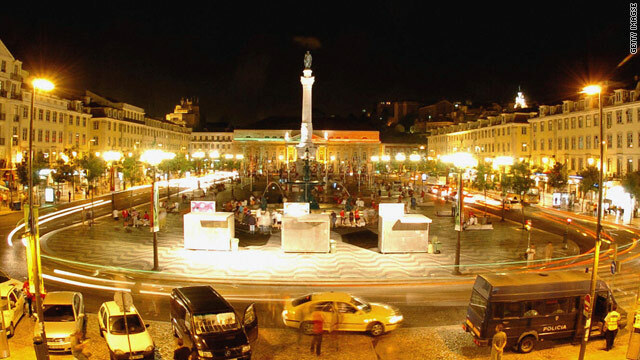 The lights of Lisbon: Around 45 percent of Portugal's power now comes from renewable sources. Lisbon, Portugal (CNN) -- In recent years Portugal has been harnessing its enviable southern European climate to benefit more than just its tourism industry. As its government announces a package of austerity measures to meet its budget deficit-reduction plans, the country is touting a USP that it believes will rescue its economy. "In the same way as Finland is famous for mobile phones, France for its high-speed trains and Germany for its industry, Portugal will become known for renewable energy," declared Manuel Pinho, the economy minister, last year. Now, nearly 45 percent of Portugal's electricity will come from renewable sources, up from 17 percent just five years ago. Land-based wind power has increased sevenfold in that time. With new contracts every week for national and international firms to work on new, cleaner power plants it seems that, on the surface at least, Portugal is eco-buying its way out of recession. The government has not installed an environmental consciousness in the people. Going green has been pragmatic policy as well as ideological. Buying fossil fuels used to contribute to half of Portugal's national deficit: with no fossil fuels of its own, almost all of its energy had to be imported, to the detriment of its fiscal balance and its energy security. In the tenure of President Silva, the Portuguese government has decided to use what it has, which is 800 miles of coastline and of course, plenty of sunshine. Ten years ago, Portugal's transmission lines were owned by private power companies that had no interest in investing in renewables, because using the technology would have meant radical changes in the grid infrastructure, increasing costs to industry. So the government bought the lines and adapted the grid. Upgrading it to increase flexibility and better connections in remote areas to allow the production and distribution of electricity from small generators, such as domestic solar panels. There was also a combination of incentives for cleaner power generation, including the introduction of feed-in tariffs. According to a 2009 European Commission report, this commitment has meant a surge in new business. The number of energy enterprises more than tripled from 2000 to 2006, the second-strongest growth after Spain. The Portuguese government says 10 new dams will boost hydropower capacity by 50 percent by 2012. Now energy companies are using their engineering know-how to pursue other eco-friendly sources, such as solar and wind, said Miguel Marques, head of Portuguese markets for NYSE Euronext. "They are looking at market opportunities worldwide and not concentrating their production base in Portugal alone," he said. WS Energia is one such innovator. Its solar technology products have won awards as well as new business in Italy, UK, Spain, France and the U.S.
"In 2006, we found a gap in the electricity market," one of its team, João Wemans, told CNN. "What we did was double the captivation of solar energy through the use of mirrors [WS Energia's 'DoubleSun' product]. From the start, this idea gained national and international recognition, and was considered at the time the smartest solar technology installed in the world." Underlying the impressive figures and bright ideas, however, is a crutch. Much of the infrastructure in Portugal is still heavily reliant on European Central Bank funding. Without this funding, projects such as Living PlanIT -- an eco-city built from scratch, planned for the northern region of Paredes -- would be impossible. Although renewable energy has been the basis for Portuguese firms to go global, many citizens are feeling left behind. Environmentalists object to government plans to double the amount of wind energy, saying lights and noise from turbines will interfere with local wildlife. Conservation groups worry that new dams will destroy Portugal's cork-oak habitats (the country's forests are one of the biggest producers of corks in the world). "The government has not installed an environmental consciousness in the people," said Rita Alvares, part of a green co-operative in Lisbon and who pointed out to CNN the lack of recycling centers in the capital. "But it is forcing it on them when it suits its own business interests." Another major concern is that the government will displace local companies with large multinationals -- as seen by a recent contract given to Finnish firm AW Energy. When the Alto Minho wind farm was built, a boost in local employment was promised, but now the plant only needs 25 people to run it. Bill-payers are also affected. The International Energy Agency based in Paris, France, has already said that Portugal's progress in renewable energy has been a "remarkable success", but "it is not fully clear that... their impact on final consumer energy prices are well understood and appreciated". Being the third largest producer of renewable energy in Europe has meant a jump in costs -- 15 percent - to household consumers of electricity in the last 10 years. As deficit-reduction plans take hold in 2010, households still faced an increase of 2.9 percent in their electricity bills. Portugal's small population helps in terms of capacity and positive-sounding percentages of usability. However the small population also has the misfortune of belonging to one of the poorest country in the European Union. As the world's markets focus their attention on Lisbon, many residents have already left because of high costs of living that do not correspond to the low wage and pension rates. Living in a renewable-energy haven has become the least of their concerns. "Solar must change from being an expensive source of energy to one of solutions which will be able to compete directly with fossil fuel," said Wemans. "We believe that a reduction in electricity tariffs is healthy -- and vital." As Portugal proves to the world its admirable goals, it still has to convince many of its own citizens of the benefits.